Introduction. This study examined health-related information needs, seeking, and source preferences between two distinct groups of mothers: U.S. mothers and immigrant Korean mothers in the U.S.A. Method. Using non-probability sampling, data were collected from five online communities through an online survey; 480 completed responses were used for analysis. Analysis. Both quantitative (using SPSS) and qualitative analyses (with Nvivo 11) were implemented in analysing the collected data. Results. Although the participants were mothers of young healthy children, the topic they searched for most frequently was information about diseases. Moreover, 93.0% of the U.S. mothers and 94.2% of immigrant Korean mothers had searched for health information in the past six months. When source preferences were compared, U.S. mothers preferred human sources (e.g. doctors, nurses, their husband and other relatives), whereas immigrant Korean mothers preferred non-human sources (e.g. online communities, books). Conclusion. Findings confirm that mothers actively search for health-related information as part of their roles as caregivers or health managers for their children. Results also imply that appropriate use of a few social media platforms has great potential for information professionals who provide health-related information to mothers with high information needs. In the past two decades, health information has become widely accessible to individuals using online and offline channels. In a nationwide survey, Pew Research Center found that 72% of adult Internet users in the United States (hereafter, U.S.) have searched online for health-related information including specific diagnoses and treatments (Fox, 2014). Mothers have been traditionally noted as active health information seekers reflecting their roles as caregivers or health managers for their family members (Chae and Quick, 2015; Koehly et al., 2009; Lee, 2016; Yoo, 2004). Previous studies have confirmed that parenthood prompts women to more actively seek health-related information (Bernhardt and Felter, 2004; Guendelman, Broderick, Mlo, Gemmill and Lindeman, 2017; Plantin and Daneback, 2009). Hearn, Miller and Fletcher (2013) reported that the first two trimesters of pregnancy and the first three months after childbirth are times that women might require a variety of new health-related information. Searching for health information is highly important for immigrant mothers as well. Immigrants are more likely to actively seek a wide range of information to adjust to new environments. Currently, the U.S. has more immigrants than any other country (Connor and López, 2016). Countries accepting immigrants have a responsibility to assist in their settlement and to provide appropriate health information services for maintaining their health. By 2055, Asians are expected to become the largest immigrant group in the U.S. (López and Bialik, 2017), with Korean immigrants comprising a large proportion of the increase (Hoeffel, Rastogi, Kim and Shahid, 2012). Thus, it will be important for information professionals to understand Asian immigrants' health-information needs and searching behaviour. Furthermore, this comparison method emphasises the seeking behaviour differences, allowing information professionals and American healthcare providers to focus on the immigrant Korean mothers' cases that they would not typically look out for because they may not know that they should be looking for these unique characteristics in Korean cases. RQ1: (1a) What are mothers' health information needs in relation to their children? (1b) Why were those topics important to participants? RQ2: (2a) How frequently do mothers utilise information and human sources when seeking health information? (2b) How does the frequency of each health information source used relate to individual characteristics? RQ3: When mothers seek health-related information for their children, which sources do they prefer? Several researchers have conducted studies to understand mothers' health information needs and searching behaviour, and health information seeking behaviour during pregnancy has been widely investigated (Lagan, Sinclair and Kernohan, 2006; Sayakhot and Carolan-Olah, 2016). Researchers have also focused on first-time mothers' information seeking behaviour (Carolan, 2007; Gazmararian, Dalmida, Merino, Blake, Thompson and Gaydos, 2014; Loudon, Buchanan and Ruthven, 2016; Weiner, Fisher, Nowak, Basket and Gellin, 2015). Loudon, et al. found that mothers' needs included information on sleep, nutrition, infant care, and activities. However, Carolan (2007, p. 1162) noted the information dilemmas of first-time mothers, finding that several mothers felt overwhelmed by ‘knowing too much'. Children's health is a key characteristic that can influence mothers' information seeking behaviour. Some previous studies examined information needs or seeking behaviour among mothers of children with specific diagnoses such as paediatric cancer (Kilicarslan-Toruner and Akgun-Citak, 2013), mental illness (Lwoga and Mosha, 2013), asthma (Archibald, Caine, Ali, Hartling and Scott, 2015), autism spectrum disorders (Fain, 2009), or Down syndrome (Eaves, Ho, Laird and Dickson, 1996; Murphree, Whitehead and Painter, 2011). However, another group of scholars did not specifically focus on the health conditions of a child when conducting research on mothers' health-information needs and seeking behaviour. For instance, although Greyson's (2017) participants were not screened based on children's specific health conditions, the results indicated that young Canadian parents sought information about pregnancy and their child's health-related concerns. Results of another online survey among 349 Belgian mothers of young children aged zero to two years showed that the most frequently searched topic related to child health was breastfeeding, followed by teeth, growth and development, and baby acne (Slomian, Bruyère, Reginster and Emonts, 2017). The authors also noted that, before seeking online information, participants consulted family members most frequently (69.5%), followed by their friends (62.9%), midwives (62.6%), general practitioners (51.2%) and journals or magazines (20.8%). Other health information sought included vaccination-related information (Guillaume and Bath, 2004; Kowal, Jardine and Bubela, 2015) and parenting information (Emmanuel, Creedy and Fraser, 2001). Similarly, Skranes, Løhaugen, Botngård and Skranes, (2014) conducted survey research among ninety-nine Norwegian mothers to understand how mothers' paediatric information needs differed in accordance with a child's health conditions. Results indicated that, when their child was sick, the most frequently searched health topic was rashes (70%); followed by symptoms of diseases (57%); when to contact the doctor (55%); and other symptoms such as coughing, diarrhoea, vomiting and fever. In contrast, when their child was healthy, the most frequently sought topic was nutrition and/or diet (57%), followed by child development (52%), allergies (42%), rashes (35%) and parenting (35%). In sum, most studies examined two groups of mothers' health information needs and seeking behaviour: (a) mothers of children with specific diagnoses or (b) mothers of children with unspecified health conditions. Therefore, this study was conducted to bridge the gap by focusing on mothers of healthy children. A nationwide survey of 550 U.S. mothers by the U.S. Centers for Disease Control and Prevention (Bailey, 2008) found that U.S. mothers were more likely to discuss issues related to health, nutrition and diet, and parenting with physicians first, whereas they were more likely to seek parenting advice from their own parents and least likely to seek parenting advice from their friends. First-time U.S. mothers' health information needs are diverse. Gazmararian and her associates (2014) conducted a large-scale focus group study among ninety-two first-time U.S. mothers of infants. The researchers determined that the mothers encountered a significant informational deficiency, especially about very basic, daily infant care such as nutrition and breastfeeding, safety issues, and developmental milestones. Additionally, Weiner and her colleagues (2015) investigated first-time expectant U.S. mothers' behaviour when searching for information on childhood vaccines. Other researchers found that U.S. mothers with young children were interested in diverse health topics such as vaccination (Baker, Wilson, Nordstrom and Legwand, 2007; Kennedy, Basket and Sheedy, 2011); treating specific paediatric health conditions, parenting issues, and development (Bernhardt and Felter, 2004); and herbal remedies (Alwhaibi, Goyat and Kelly, 2017). Regarding health information sources, a national survey (Bailey, 2008) of 550 U.S. mothers indicated that the top seven most-trusted information sources were paediatricians (58%), friends and family (55%), evening news (39%), Internet searches (38%), a physician's office (37%), Websites (33%) and parenting books (32%). Other research focused on first-time mothers living in the U.S. (Gazmararian, et al., 2014; Weiner, et al., 2015). Gazmararian's research team noted that most first-time mothers preferred in-person; electronic; or video media including DVDs, Websites, and mobile applications to written materials or pamphlets. Regarding frequency of information seeking behaviour, study results among first-time mothers (Weiner, et al., 2015) indicated that 62% looked for information about childhood vaccines in a one-month period. There are conflicting results regarding information sources used. Studies on U.S. mothers' information seeking behaviour found that the primary sources of vaccine-related and paediatric information were physicians and nurses (Baker, et al., 2007; Bernhardt and Felter, 2004; Kennedy, et al., 2011). Yoo (2004) also found that middle-aged U.S. mothers most frequently used healthcare professionals as their information sources, which was consistent with similar study results. However, relatively recent studies suggested different findings. For example, Alwhaibi, et al. (2017) noted that the Internet was the most frequently used source among U.S. mothers seeking information on herbal remedies. Moreover, Weiner and her research team (2015) found that Internet search engines (e.g., Google, Yahoo) were the most important sources among their participants (36%), followed by family (27%), healthcare professionals (22.5%), online parenting sites (19%) and friends (17%). Other studies investigated information needs or searching behaviour of mothers in disadvantaged populations or ethnic minority groups living in the U.S. (Criss, Woo Baidal, Goldman, Perkins, Cunningham and Taveras, 2015; Davis, Cole, McKenney-Shubert, Jones and Peterson, 2017; Guendelman, et al., 2017; Guerra-Reyes, Christie, Prabhakar, Harris and Siek, 2016). Davis and her associates investigated Mexican American mothers' information needs about childhood obesity risks, whereas Criss and her research team reported sources used by Hispanic mothers' during their children's first 1,000 days of life. In a large-scale focus group study among low-income U.S. mothers Guendelman, et al. reported that only three percent of their study sample did not search for health information at all. These authors reported that mothers in their sample preferred face-to-face contact with healthcare providers or with other mothers when seeking health-related information, advice and support. Health-information needs and seeking behaviour among Korean immigrants in the U.S.A. There are only a few previous studies about immigrant Korean mothers in the U.S.A., and the characteristics of recent Korean immigrants have changed dramatically compared to several decades ago (Zong and Batalova, 2017). While earlier immigration waves from Korea consisted of many unskilled labourers and their families, the contemporary Korean immigrant population has high socio-economic standing with relatively high educational attainment compared to the overall foreign-born and native-born populations. As of 2015, more than half (53%) of Korean immigrants aged twenty-five years and older had at least a bachelor's degree, compared to 29% of the total U.S. foreign-born population and 31% of the native-born population (Zong and Batalova, 2017). Despite the unique characteristics of Korean immigrants, there is a dearth of research related to the questions of health information needs or seeking behaviour among immigrant Korean mothers (hereafter, 'Korean mothers'): however, several previous studies addressed health information needs, searching and usage behaviour among Korean Americans (Huh, DeLorme, Reid and Kim, 2013; Kim, 2013; Kim, Kreps and Shin, 2015; Oh, Kreps, Jun, Chong and Ramsey, 2012; Oh, Kreps, Jun and Ramsey, 2011; Park and Park, 2014; Yi, Stvilia and Mon, 2012) or Korean American women in the U.S.A. (Oh, et al., 2015; Kim and Yoon, 2012). It should also be noted that Lee (2017) conducted an exploratory study to understand health-information needs and seeking behaviour among Korean mothers of children aged zero to ten years living in the U.S.A. Regarding information needs, some studies focused on specific health topics such as cancer-related information (Park and Park, 2014; Oh, et al., 2015; Oh, et al., 2011) or prescription drug information (Huh, et al., 2013). Kim and Yoon (2012) reported that the top five health information needs among Korean women in the U.S. were diagnosis, treatment, medication, general health and advice on whether to consult a doctor. Kim (2013) and Kim, et al. (2015) also identified five significant topics of health information as recommendations about hospitals or doctors, preventive care, diagnosis of specific disease, diet and/or exercise and medications. Furthermore, Lee (2017) highlighted that the top five health topics that Korean mothers considered to be essential were vaccination, child dental health, parenting, nutrition and diet, and physical exercise. Regarding frequency of searching behaviour, Lee (2017) reported that the frequency of immigrant Korean mothers' health-information seeking behaviour varied dramatically. In her study, 4.4% of the mothers sought health information related to their children more than once a day, whereas 13.3% of participants reported that they had not looked for health information for their children in the past six months. Regarding the type of information sources used, Lee (2017) found that Korean mothers used the Internet most frequently (97.4%), followed by healthcare providers (87.2%), books (79.5%), newspapers and/or magazines (69.2%) and TV programmes (53.8%). Friends, church members and family members were also key sources for Korean Americans searching for health information (Kim, 2013; Kim, et al., 2015). In addition, Yi and her associates (2012) noted that Korean Americans in their sample used search engines (e.g., Google or Naver—a popular search engine in South Korea) most frequently when seeking health-related information. Yi, et al. (2012) found that 15% of their participants heavily relied on print materials (e.g., magazines, newspapers), whereas 20% of participants preferred consumer health information obtained from family members or friends. The above results are not surprising, because previous studies conducted among Korean mothers in Korea found that Korean parents tend to heavily rely on the Internet (Suh, 2004) or online forums (Chae and Quick, 2015; Kim and Kim, 2007). Results of other studies revealed that, because of language barriers, several Korean Americans tended to search for health information from their ethnic media and the Internet, which are both available in Korean (Oh, et al., 2015; Oh, et al., 2012). In addition, Oh, et al. (2015) reported that although the Internet, family or friends, and Korean ethnic media were used more frequently than healthcare providers or U.S. mainstream media (e.g., TV, radio, newspapers or magazines), the most trusted information source was healthcare providers (47.2%), followed by Korean TV channels (22.6%), family or friends (20.3%), and Korean magazines (17.3%). To summarise, although a substantial amount of research has been conducted to investigate health-information behaviour among mothers in native populations or Korean Americans, most research has focused on mothers of children living with specific diagnoses. The present study compared health-information behaviour between two groups of mothers of young healthy children: U.S. mothers and Korean mothers. Sonnenwald (1999, 2005) presented the concept of information horizons to investigate individuals' information-seeking behaviour in context. Information horizons indicate that a person is looking forward to the information landscape, so it is a positional metaphor for information seeking, and mapping horizons graphically illustrates this positional metaphor. This concept and method are grounded on empirical studies of people's information behaviour in diverse research disciplines including information science and sociology. In this method, three fundamental concepts have been suggested: context, situations, and social networks (Sonnenwald, 1999) and the information horizon is made up of those three elements. Sonnenwald defines contexts as 'multi-dimensional and can be described by a variety of attributes which might include place, time, goals, tasks, systems, situations, processes, organisations, and types of participants' (p. 179). For instance, contexts may include family life, academia and citizenship. For example, when mothers seek health information for their children, it is considered to be within the family-related context but is outside the boundaries of the academic context. The second fundamental concept is situations. Within each context, several situations may come up; for instance, within the context of family life, seeking health information for children, attending a family-related event and preparing meals for family members are three different kinds of situations. That is, a context is somehow larger than a situation and may be composed of various situations. The third underlying concept is social networks. Social networks may help to establish situations and contexts and are constructed of situations and contexts. Although Sonnenwald pointed out (p. 180) that social networks refer to communication among individuals, her five propositions of the model included not only social networks as information sources but also other documents or information resources when examining individuals' information behaviour. As an example, a mother's information horizon may consist of diverse information sources including social networks (e.g., family members, health care providers, friends); documents (e.g., books, Webpages); or information retrieval tools (e.g., databases). Sonnenwald's information horizon is still an evolving method, and there are a variety of ways to investigate individuals' information horizons. It is noteworthy that information horizon could be a useful theoretical framework to understand people's information seeking behaviour and source preferences as well. Sonnenwald suggested that conducting in-depth interviews and facilitating information horizon map drawings could help to discern users' information horizons more effectively (Sonnenwald, Wildemuth and Harmon, 2001; Sonnenwald, 2005). Moreover, Sonnenwald and her colleagues also highlighted the importance of triangulation, and employed a survey asking individuals' frequencies and preferences of information use. Savolainen and Kari (2004) further expanded and specified the concept of information horizon by using three concentric circles to illustrate how users prioritise information sources according to their preferences. In sum, the current study included a variation of Savolainen and Kari's (2004) concept of concentric circles and Tsai (2013) in the online questionnaire for better understanding mothers' source preferences when they seek information related to their children's health. This study contributes to the literature by providing a novel way of describing mothers' information behaviour by allowing them to graphically represent their source preferences. From June until early October 2017, a Web-based survey was used to collect data. Participants were recruited through postings on several online communities of mothers. Thirteen online community administrators were contacted, providing details about the study, for permission to post recruitment messages on their specific sit. The main characteristics that influenced the choice of online communities included: (a) sites that target U.S.-born mothers of young children aged up to three-years old or sites that engage Korean mothers living in the U.S.A., (b) sites that are designed to provide parenting-related information, (c) sites that do not focus on one specific medical diagnosis and (d) sites that are willing to support the research study. Moreover, online communities utilised in the literature in this area (Holtz, Smock and Reyes-Gastelum, 2015; Kim and Yoon, 2012; Park and Park, 2014; Pinkerton, 2010; Smallwood, 2014) were contacted. Ultimately, the administrators of five online communities agreed to allow the study to be promoted on their site (Table 1). their child had never been treated by a specialist (e.g., paediatric allergist, paediatric dermatologist, paediatric neurologist, etc.). The final two conditions were added to focus on healthy children's mothers. Participation was voluntary. Of the 1,217 recorded responses, 564 respondents did not meet the criteria and were screened out in accordance with the selection criteria; 173 respondents did not complete the survey. Consequently, 480 responses were included in the analyses. Specifically, the resulting sample sizes for analysis were 272 U.S. mothers, and 208 Korean mothers living in the U.S. Once the data collection was completed, gift cards were awarded to those respondents selected by a random draw. This study was reviewed and approved by the Social/Behavioural Science Institutional Review Board of the researcher's institute (date of approval: May 2, 2017). An online questionnaire was developed based on previous literature. Other than screening questions, the questionnaire consisted of three sections: (a) health information needs related to their children, (b) health information source use and preferences and (c) demographic information. First, to examine mothers' health information needs, an open-ended question was asked of participants (Kim, 2013). In addition, participants were asked why those health topics were important to them. Second, regarding health-information source use, respondents were asked to illustrate how frequently they used individual information sources in the past six months using five-point Likert scales (one = never to five = very frequently). The survey included fourteen information sources, which were developed from previous literature (Kim, Sin and Tsai, 2014; Lee, 2017). Next, to understand each information source's preference (RQ3), the researcher provided: (a) a sample of an information horizon map, which was adapted and modified from a previous study (Tsai, 2013); and (b) brief instructions on how to answer a question regarding each source's information preference (see Figure 1). After that, nineteen diverse types of information source were listed, which were also developed from the Health Information National Trends Survey (National Cancer Institute, 2017) and previous literature (Kim, et al., 2014; Lee, 2017). Participants were asked to select one of the most appropriate zones for each information source (zone one = the most preferred sources; zone five = the least preferred sources). It should be noted that there could be more than one source for each zone. In addition, if a participant did not use the specific information source, she was able to select one of the options as 'not in my information horizon'. Therefore, responses from participants who answered, 'not in my information horizon' were excluded from the analyses pf the specific information sources. Demographic characteristics collected included age, ethnicity, highest level of completed education, annual household income, current employment status, health insurance coverage for herself (yes/no), health insurance coverage for her child (yes/no), years living in the U.S., primary languages spoken, and number of children. In addition, to help in-depth understanding of the survey among Korean mothers residing in the U.S., the question items were carefully translated to maintain the meanings and nuances of the original questionnaire. The translated versions were finalised after pre-testing with a few immigrant mothers from Korea. Several methods were adopted to analyse the collected data. To understand mothers' health-information needs related to their children (RQ1), an inductive open coding approach was used in the study. Participants' textual responses to an open-ended question were uploaded into NVivo 11 for coding and analysis. The author and coding team worked together to develop the coding scheme. The coding team included an author of this paper and two graduate studentsd; a native Korean who analysed Korean mothers' responses and a U.S. born individual who analysed U.S. mothers' responses. The team initially reviewed a sample of the responses independently to find themes in mothers' health information needs. Next, the coding team reviewed the proposed code lists together, discussing similarities and differences in the codes which were applied in an inductive and repetitive process (Ahuvia, 2001; Neuendorf, 2002, 2017). Disagreements were resolved through discussion. The coding team worked through a series of review sessions to arrive at the code lists focusing on two questions: (a) what health topics mothers of young healthy children have looked for in the past six months, and (b) why those topics were important to them. While subtle differences existed, the coding team did not find significant discrepancies and a few minor discrepancies were resolved through further discussion to ensure intercoder reliability and the credibility of the analysis (Gaskell and Bauer, 2000; Golafshani, 2003; Lincoln and Guba, 1985; Worrall and Oh, 2013). The final codebook is attached in Appendix A. To address other research questions (RQ2 and RQ3), descriptive and inferential statistics were conducted using IBM SPSS Statistics version 24. Ordinal regression analyses were used to determine the relationships between an ordinal-level dependent variable (e.g., a five-point Likert scale) and more than one independent variable (Garson, 2014; Sin and Kwon, 2017; Yi, 2016). Ordinal regression also requires an adequate sample size and the absence of high multicollinearity. According to Teddlie and Tashakkori (2009), when a given population is over 10,000, a sample size should be at least 384 to maintain a 95% confidence interval (5% precision). Hence, in this study, the sample is large enough to be representative and reach a 95% confidence interval in all statistical analyses. Multicollinearity diagnostics were also conducted to ensure that no predictor variables were too highly intercorrelated. A tolerance statistic lower than 0.2 or a variance inflation factor (VIF) higher than ten proposes multicollinearity problems (Field, 2009). In this study, the tolerance statistics were all higher than 0.2 (i.e. 0.201 and 0.820 for U.S. and Korean immigrants' sample data, respectively). The VIF values were all lower than ten (i.e. 4.981 and 1.219 for U.S. and Korean immigrants' sample data, respectively). Therefore, these results suggest the data had no multicollinearity issues. A total of 480 respondents were included in the analysis. The demographic profile of the survey respondents is shown in Table 2. The U.S. sample comprised 272 respondents. More than half of these respondents were between thirty-one and thirty-five years old (52.9%). A plurality of the U.S. participants had four-year college degrees (46.0%) followed by master's degrees (26.5%) and doctoral degrees (9.6%). The income levels of the U.S. sample were relatively high with over 50% having more than $100,000 annual household income, compared to the 2016 U.S. median household income of $57,617 (Guzman, 2017). In terms of employment status, more than 68% of the U.S. sample were working either full-time (51.1%) or part-time (17.3%). The Korean immigrants' sample had 208 respondents. Like the U.S. sample, more than half of the Korean respondents were between thirty-one and thirty-five years old (52.4%). Also, more than half of the Korean sample had bachelor's degrees (50.5%), while 30.8% had master's degrees and 7.2% had doctoral degrees. Regarding annual household income, about one-fifth of the Korean sample (19.7%) belonged to the $50,000 - $74,999 category. The majority of the Korean respondents were stay-at-home mothers (81.7%) and unlike the U.S. sample, a plurality of the Korean mothers had only one child (63.0%). Table 3 shows mothers' health information needs in relation to their children. Interestingly, there was a close similarity of information needs between U.S. mothers and Korean mothers. Both groups of mothers reported that they had sought out information about diseases (i.e. 48.53% and 42.79% for U.S. and Korean immigrants' sample data, respectively) most frequently although they were defined as mothers of healthy children in this study. Within the diseases category, skin and connective tissue diseases (e.g., rash, nappy rash, atopic dermatitis, eczema, heat rash, etc.) was the most frequently sought health topic from both groups of mothers (20.59% among U.S. mothers; 19.71% among immigrant Korean mothers). Furthermore, there were similarities among the top four popular health topics; however, a higher number of Korean mothers looked for nutrition and diet information (42.31%) than growth and development information (31.73%) for their children. Worth noting is that U.S. mothers of young children more actively sought sleep-related information (22.43%) compared to Korean mothers (7.21%). I also looked up language development for a 1 year old to check that my child is on track with development (US52). My 15 mo[nth] daughter had a mild fever without other noticeable symptoms. So I wanted to make sure she was teething (KOR114). I had also looked up information on teething for my daughter as she has been drooling more than normal and being fussier that usual (US40). I searched the topics on eczema, heat rash, and plagiocephaly, because my baby was having related symptoms and it was important for me to learn both experts' and other mothers' opinions and experiences regarding these topics (KOR38). Strange rash, high fevers – Mostly worried about whether she needed to see a doctor or whether she would be ok without a visit (US77). It was to decide if we needed to take our daughter to clinic (KOR165). Nutrition – Since American foods are very salty, I look for a lot of nutritional information to take less sodium (KOR50). In Korea, it is easy to get prescriptions and cheap to visit clinic in accordance with my child's health conditions, whereas it is (relatively) not easy to meet paediatrician and get prescriptions in the US (KOR123). It is not that easy to visit clinic compared to Korea. Even though I visit with my child, they always say 'do what they want' (KOR25). To summarise, although the mothers' health information needs related to their children were similar between both groups of mothers, the reasons the topics were important to them varied. When mothers were asked if they looked for health information related to their children in the past six months, most participants in both groups answered that they did (U.S. mothers = 93.0%; immigrant Korean mothers = 94.2%); however, differences appeared when participants were asked about the frequency of their searching behaviour (see Figure 2). Surprisingly, about 17% of the immigrant Korean mothers answered that they looked for health information related to their children more than once a day, whereas only 1.5% of the U.S. mothers answered that they did. A plurality of the U.S. participants looked for health information for their children a few times a month (43.4%). On the other hand, a plurality of the Korean respondents looked for health-related information for their children a few times a month (29.8%), followed by one to three times a week (26.4%), more than once a day (16.8%), and four to seven times a week (14.9%). It is notable that the immigrant Korean mothers were more likely to be active in seeking health information related to their children. The frequency of using each type of health information source is shown on Table 5. Participants were asked how frequently they utilised the specific source using five-point Likert scales (one = never used to five = very frequently). The most frequently used source was the World Wide Web for both groups (U.S. sample: Mean = 3.81, Standard deviation = 1.13; Korean immigrants' sample: Mean = 4.49, Standard deviation = 1.02). Interestingly, a difference was detected in the frequency that other sources were used. For example, the second most frequently used source among Korean mothers was blogs or online forums (Mean = 4.03, Standard deviation = 1.12), whereas the second most frequently utilised source among U.S. mothers was friends who have kids (Mean = 2.92, Standard Deviation = 1.08). Furthermore, unlike the U.S. sample, Korean mothers utilised family (Mean = 2.94, Standard Deviation = 1.12) more frequently than healthcare providers (Mean = 2.79, Standard Deviation = 1.04) when seeking health information related to their children. A few information sources such as resources provided by librarians, and friends without kids were not as popular as other health information sources in either group. When overall frequencies of information source use were compared between the two samples, the mean usage frequency for the Korean immigrants' sample was higher than mean for the U.S. sample. This implies that recent Korean mothers tend to utilise each type of information source more frequently than U.S. mothers when seeking health information related to their children. Note: M=Mean; SD = Standard Deviation. Mean scores based on 5-point Likert scale: 1 = Never used; 5 = Very frequently. Participants' country of birth and citizenship are one of the main foci in the current study. A series of independent t-tests were conducted to examine whether there were any statistical differences in each type of information source's use between both groups (Table 6). Results indicated that twelve out of fourteen sources showed significant differences between the two groups in the frequency with which they accessed health information sources. For instance, compared to U.S. mothers, Korean mothers tend to use blogs or online forums (t (478) = 17.50, p < 0.001), social media sharing sites (e.g., YouTube, Flickr etc.) (t (478) = 13.66, p < 0.001), and health-related programmes on TV (t (478) = 11.57, p < 0.001) more frequently when seeking health-related information for their children. Note. Mean scores based on 5-point Likert scale: 1 = Never used; 5 = Very frequently. To estimate the magnitude of group difference, effect size was computed using Cohen's d. The effect size is considered very small when d = 0.01, small when d = 0.20, medium when d = 0.50, large when d = 0.80, very large when d = 1.20, and huge when d = 2.0 (Cohen, 1988; Sawilowsky, 2009). When effect size of the group differences was measured for the twelve statistically significant information sources, they varied a lot from very large (e.g., blogs or online forums, d = 1.60) to small (e.g., social networking sites, d = 0.28). Furthermore, RQ2 also asked how the frequency of using each information source related to individual characteristics. For example, among U.S. mothers, the researcher tested whether individual characteristics would affect participants' use of healthcare providers as an information source. That is, the dependent variable was frequency of using each source (fourteen information sources), and the independent variables were individual characteristics such as age, education, annual household income, employment status, years lived in the U.S., and number of children. Ordinal regression analyses were used to test the relationships between the independent variables and the frequency of using specific information sources. The overall results of the ordinal regression tests are shown in Appendix B, and only significant models are reported in Table 7. The statistically significant variables are shown in each table with asterisk marks (*). Note 1. * p < 0.05. ** p < 0.01. *** p < 0.001. Note 2. The dagger (†) indicates a reference group. Note 3. Participants who did not clearly answer to annual household income and years lived in the U.S. questions were excluded in analysing the data for this research question. Note 4. Independent variables named age, education, annual household income, employment status and number of children were recoded due to considerably limited number of participants in each category. For instance, age was recorded into three separate groups: (a) 18-30, (b) 31-35 and (c) 36 or above. Note 5. An independent variable named employment status was excluded when it was tested with two dependent variables friends without kids and microblogging sites, because its zero frequency in a few categories makes the model unstable. In an ordinal regression analysis, the odds ratio is used to measure how various levels within each independent variable affect the direction and magnitude of changes in the dependent variable (Garson, 2014). The odds ratio is a numerical value of exponentiated regression coefficient. Regarding interpreting the results, the odds ratio for a subgroup needs to be interpreted in relation to the reference group (which will have an odds ratio of one). Odds ratio may be particularly useful to determine what independent variables have a significant effect on dependent variables. For categorical independent variables (e.g., age, which had three separate groups in this study: (a) eighteen to thirty years, (b) thirty-one to thirty-five years, and (c) thirty-six years and older), the results could be interpreted with the odds that one group (e.g., aged eighteen to thirty years) had a higher or lower value on the dependent variable (e.g., using books as their health information source) compared to the reference group (e.g., aged thirty-six years and older). For continuous independent variables (e.g., years lived in the U.S.A., measured in years), the results can be interpreted by how a single unit increase or decrease in that variable (e.g., one year increase or decrease in length of stay in the U.S.A.), was associated with the odds of the dependent variable having a higher or lower value (e.g., one year increase in participants' length of stay in the U.S.A. increases or decreases the odds that they would use books as their health information for their children). The interpretation of the odds ratio is described in the following sections. The fourteen information sources' frequency of use were tested against individual characteristics. Results indicated that, for seven sources, the frequency of use was significantly associated with U.S. mothers' individual characteristics (see Table 7): family, friends with kids, friends without kids, books, newspapers/magazines, resources provided by government health agencies, and social media sharing sites (e.g., YouTube, Flickr etc.). For the significant characteristics, the odds ratio can be interpreted as follows: ceteris paribus, a U.S. mother with a specific characteristic is more likely to use a specific information source if that characteristic has an odds ratio higher than one (odds ratio > one). The higher the odds ratio, the higher the likelihood a U.S. mother with a specific characteristic is likely to use a specific information source when seeking health information. For instance, the annual household income category in the family model $50,000 - $74,999 had an odds ratio of 3.32, indicating that a U.S. mother with an annual household income of $50,000 - $74,999 was 3.32 times more likely to use family as their health information source than a U.S. mother with an annual household income of $100,000 or above (reference group). Overall, when other models were also examined, an independent variable named number of children was one of the most important characteristics influencing U.S. mothers' health information source use. The odds ratios of the independent variables are fully reported in Appendix B1. Among the fourteen information sources, only the frequency of using healthcare providers as an information source was significantly associated with recent Korean immigrant mothers' individual characteristics (see Table 7). When the healthcare providers model was carefully investigated within the education variable, the some college or under category had an odds ratio of 0.12. This illustrates that a Korean immigrant mother with some college or under education level is significantly less likely to use healthcare providers as her health information source, compared to a recent Korean immigrant mother with a doctoral degree (reference group). In other regression models, participants' individual characteristics were not large enough to be significant but are still worth noting (see Appendix B2). Although participants' individual characteristics did not significantly influence their frequency of source use to make the overall regression model statistically significant, there were some characteristics that affected mothers' frequency of using each source. For example, a recent Korean immigrant mother who completed a doctoral degree was significantly more likely to use books as her health information source related to children than a Korean immigrant mother without a doctoral degree. Although the highest level of education somewhat influenced Korean immigrant mothers' use of books as their health information source, the effect was not statistically significant. To understand each source's preference, mean values of nineteen source's preference scores were compared between both groups of mothers (Table 8). 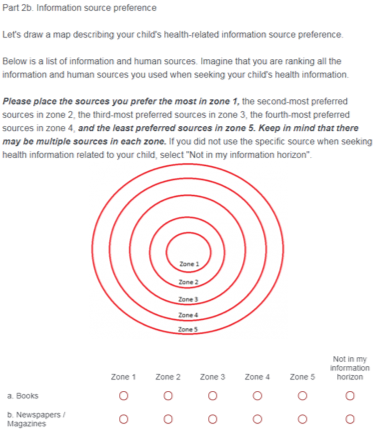 When each information source's preference was analysed, the researcher provided reversed scores to each zone (five = zone one (the most preferred sources); one = zone five (the least preferred sources)). This method was adapted from previous empirical studies (Savolainen and Kari, 2004; Tsai, 2013). That is, the higher the mean value, the higher likelihood the specific source will be included in zone one. Note 1. Mean scores based on 5-point Likert scale: 5 = Zone 1 (the most preferred sources); 1 = Zone 5 (the least preferred sources). Note 2. Participants who did not use the specific source and answered, ‘Not in my information horizon' were excluded from the analysis. When the top three preferred information sources were compared, it is notable that healthcare providers such as doctors (M = 4.68, SD = 0.71), nurses (M = 4.57, SD = 0.76) and the World Wide Web (M = 4.23, SD = 0.91) tended to be the most favoured sources compared to other resources among U.S. mothers. In contrast, Korean mothers preferred the World Wide Web (M = 4.48, SD = 0.98), doctors (M = 4.10, SD = 1.13) and blogs or online forums (M = 4.09, SD = 1.11). It is quite surprising how much immigrant Korean mothers tend to prefer blogs or online forums (M = 4.09, SD = 1.11) when seeking health information related to children, because its preference is very close to how much they prefer doctors (M = 4.10, SD = 1.13) as their health information source. Additionally, it needs to be highlighted that, although the World Wide Web was the most frequently used source among U.S. mothers (see Table 5), they prefer healthcare providers such as doctors (M = 4.68, SD = 0.71) or nurses (M = 4.57, SD = 0.76) to the World Wide Web (M = 4.23, SD = 0.91). Similarities were shown when the mean values of the top ten preferred sources were compared between both samples. However, worth noting is that other relatives were more likely to be preferred by U.S. mothers (M = 2.95, SD = 1.17), whereas Korean mothers tended to prefer books (M = 3.14, SD = 1.36). A few information sources such as librarians (U.S.: M = 1.75, SD = 1.05; Korean immigrants: M = 1.95, SD = 1.24) and friends without kids (U.S.: M = 1.75, SD = 1.05; Korean immigrants: M = 1.95, SD = 1.24) were the least preferred information sources in both samples. A series of independent t-tests was conducted to test similarities and differences in the preferences of each information source between both groups of mothers. Of the nineteen information sources, Table 9 presents the t-test results of nine non-human information source preferences, whereas Table 10 presents the t-test results of ten human information source preferences. For a more accurate understanding of the collected data, both mean and mode were reported. Independent t-tests were conducted to test whether there were significant differences in preferences of the ten human sources (see Table 10). Results indicated that six out of ten human source preferences were significantly different between groups of mothers. For example, compared to recent Korean immigrant mothers, U.S. mothers preferred doctors (t (312) = 6.42, p < 0.001, d = 0.61), (t (256) = 8.55, p < 0.001, d = 0.87), husband or spouse (t (357) = 5.97, p < 0.001, d = 0.58), and other relatives (t (332) = 3.69, p < 0.001, d = 0.42), when seeking health-related information for their children. This is quite interesting because Korean mothers were more likely to prefer non-human sources, while U.S. mothers tended to prefer human sources. In addition to the statistical analyses, graphical representations of each group's source preferences are displayed using the information horizon theoretical framework (see Figure 3). Since the statistical analysis was done by the mean values of each source's preference, the following source preferences were drawn by another type of average called mode. Mode refers to the most frequent number on the preference of respective source in each group. When sources in zone one were carefully examined in both samples, U.S. mothers tended to favour doctors, nurses, the World Wide Web and husband the most, whereas Korean mothers were more likely to prefer the World Wide Web, doctors, blogs or online forums and nurses. It is worth noting that U.S. mothers expressed their spouse as one of their most preferred sources, while immigrant Korean mothers selected online communities as one of their most preferred sources. Moreover, when the sources in zones one and two were compared, results confirmed that U.S. mothers tended to prefer human sources because six out of eight information sources (75%) in zones one and two were human sources including mothers and mothers-in-law, other relatives, and friends with kids. In contrast, Korean mothers somewhat equally liked human (five out of nine, 55.56%) and non-human sources (four out of nine, 44.44%) when seeking health information related to their children. Interestingly, several U.S. mothers put other relatives in zone two (somewhat preferred sources) in their information horizon, whereas immigrant Korean mothers were likely to put other relatives in zone five (the least preferred sources). The results revealed some interesting findings with respect to mothers' health information needs, searching behaviour and source preferences related to their children. First, the data from RQ1 revealed that both U.S. mothers and Korean mothers sought information about diseases most frequently among diverse health topics related to their children. Previous literature noted that a child's health conditions can be one of the crucial factors that may influence mothers' information seeking behaviour (Chae and Quick, 2015; Skranes, et al., 2014). In the current study, although participants were defined as mothers of young healthy children, mothers' concerns regarding their child's health and information needs related to specific diagnoses remarkably existed. This finding was consistent with previous studies, which reported that mothers would like to know about diagnosing and/or treating specific paediatric health conditions (Bernhardt and Felter, 2004) or immediate health concerns such as a rash (Greyson, 2017). Moreover, this finding was consistent with previous research conducted by Greyson (2017), in that within the diseases category, the health topic searched for most frequently by both groups of mothers was skin and connective tissue diseases including rash, nappy rash and eczema. This can be explained by mothers' responses to the second open-ended question. Although their children were defined as healthy children in accordance with the selection criteria of this study, their children often showed signs or symptoms of disease, which influenced mothers to value information about diseases. Nevertheless, the finding contrasts with several other studies that reported mothers' most wanted information regarding their children included vaccination-related information (Lee, 2017), sleep (Loudon, et al., 2016), breastfeeding (Slomian, Bruyère, Reginster and Emonts, 2017), or nutrition and diet (Skranes, et al., 2014). Except for information about diseases, it is also notable that Korean mothers valued nutrition and diet information most highly. The cultural background of Korea may explain this finding. In both Korea and among Korean Americans, the primary caregiver of children may almost always have been the mother (Park, et al., 2016). By conducting a focus group study, the researchers found that mothers' responsibility for children's nutrition and diet may have been especially highlighted in their culture, and mothers were more likely than other family members to be influential in maintaining children's healthy lifestyles (Park, et al., 2016). Thus, Korean mothers' tendency to actively search for information about nutrition and diet for their children might reflect their beliefs that the dietary habits of Korean immigrant families heavily rely on how they prepare meals in everyday life. This finding supports previous studies that noted immigrants' cultural beliefs may affect their health information needs (e.g., Allen, Matthew and Boland, 2004; Caidi, Allard and Quirke, 2010; Sligo and Jameson, 2000). Interestingly, when mothers were asked why the health topics were important to them, several reasons were identified. Both groups of mothers expressed that the specific health topics were important to check up or to make sure if their child's condition was on the right track. These results paralleled those of a classic study about mothers' paediatric information seeking (Bernhardt and Felter, 2004), because the researchers also found that their participants looked for information to clarify or supplement what they had been told by their healthcare professionals. Second, the findings relating to RQ2 revealed that nearly all mothers had sought health information related to their children in the past six months. Surprisingly, this numerical figure is higher than a national survey conducted among U.S. adults by the Pew Research Center (Fox, 2014). Results indicated that 72% of adult Internet users mentioned that they searched online for information about diverse health issues. Similarly, the Health Information National Trends Survey also found that approximately 70% of U.S. adults reported that they used the Internet when they needed health or medical information (National Cancer Institute, 2015). Therefore, like several previous studies implemented among mothers (Lee, 2017; Skranes, et al., 2014; Yoo, 2004), the findings of this study confirm that mothers more proactively search for health-related information as part of their roles as caregivers or health managers for their children. Moreover, when the frequency of searching behaviour was compared, Korean mothers had sought information much more actively on health topics related to their children than U.S. mothers. Surprisingly, 16.8% of Immigrant Korean mothers of young healthy children had searched for health-related information for their children more than once a day, whereas only 1.5% of the U.S. mothers had done so. This stark difference might be explained by characteristics of the research participants in this study. Regarding the employment status of the participants, most of the Immigrant Korean mothers were stay-at-home mothers, while most of the U.S. mothers were working full-time or part-time. It could be possible that the Immigrant Korean mothers spend more time with their children and seek health information more frequently. Moreover, 63% of the Korean mothers were first-time mothers, while 39.7% of the U.S. mothers were first-time mothers. Results of previous studies support the finding that being a first-time mother might impact information-seeking behaviour (Carolan, 2007; Gazmararian, et al., 2014; Loudon, et al., 2016; Weiner, et al., 2015). That numerical value was notably higher when compared with other studies, which were conducted among disadvantaged mothers in the U.S. (Guendelman, et al., 2017; Lee, 2017). For example, in an exploratory study, Lee found that only 4.4% of the Korean mothers in the sample sought health information related to their children more than once a day. Regarding sources used when mothers seek health information, several sources were identified by previous studies. For example, some studies found that physicians and nurses were the most commonly used source (Baker, et al., 2007; Bailey, 2008; Bernhardt and Felter, 2004; Kennedy, et al., 2011; Yoo, 2004), while other studies illustrated that the Internet was the most frequently used source among mothers (Alwhaibi, et al., 2017; Lee, 2017; Slomian, et al., 2017). The current study confirmed that both the World Wide Web and health professionals were the most frequently used sources among mothers of young healthy children. Moreover, this study further adds to the literature regarding frequent use of social media by categorising the social media into several specified types: social networking sites (e.g., Facebook, Instagram), social media sharing sites (e.g., YouTube), microblogging sites (e.g., Twitter), and online forums. Those were adapted from previous social media research (Kim, et al., 2014) to better understand what social media platforms were used more than others. Mothers tended to utilise a few types of social media (e.g., online forums, social networking sites) more frequently than traditional media (e.g., television, newspapers, or magazines). This tendency of lower use of classic media was also shown in recent studies (e.g., Chae and Quick, 2015; Slomian, et al., 2017). In this study, it also needs to be highlighted that all four social media platforms were used more frequently among Korean mothers than U.S. mothers. This finding implies that appropriate use of social media has vast potential for healthcare providers or government health agencies to provide health information to mothers who have high information needs. When information sources' frequency of use was tested with individual characteristics using ordinal regression analyses (RQ2), results indicated that the U.S. mothers' individual characteristics were statistically associated with the frequency of use in seven sources: family, friends with children, friends without children, books, newspapers and/or magazines, government health agencies, and social media sharing sites (e.g., YouTube). Overall, when other models were carefully investigated, an independent variable named number of children was one of the most important characteristics influencing U.S. mothers' use of health information sources. This supports the current research trends of conducting several studies among first-time mothers in the field of health information seeking (Carolan, 2007; Gazmararian, et al., 2014; Loudon, et al., 2016). Furthermore, when health information providers use specific sources to distribute health information for U.S. mothers of young children, understanding their individual characteristics can be helpful for effective delivery of the health information or messages. Interestingly, the only frequency of using healthcare providers as a health information source was significantly associated with the Korean mothers' individual characteristics. This finding illustrates that, within the Korean immigrant mothers' group, individuals' characteristics were less significantly related to frequency of other types of used sources. However, when the healthcare providers model was carefully investigated within the education variable, the some college or under category had a low odds ratio, highlighting that a Korean mother with the some college or under education level is significantly less likely to use healthcare providers as her health information source, compared to a recent Korean mother with a doctoral degree (the reference group which was set to have odds ratio of one). Moreover, when other models were closely investigated, education level was one of the most important characteristics influencing recent Korean mothers' health information source use. 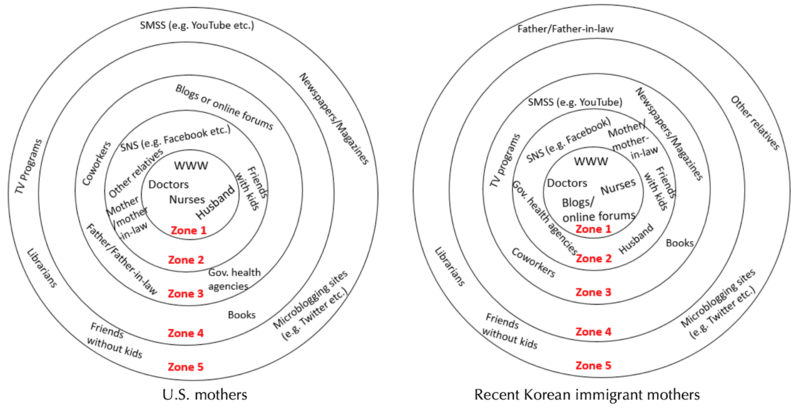 Furthermore, when a graphical representation of participants' source preferences was illustrated using information horizon theory and sources in zones one and two were compared between both samples, it is quite interesting that Korean mothers favoured human and non-human sources relatively equally, when they search for health information related to their children. On the other hand, results confirmed that U.S. mothers predominantly preferred human sources. Moreover, several U.S. mothers put other relatives in zone two (somewhat preferred sources) in their information horizon, whereas Korean mothers were likely to put other relatives in zone five (the least preferred sources). These findings are intriguing because several previous studies found that people tended to prefer human sources to non-human sources when seeking health information (e.g., Bailey, 2008; Baker, et al., 2007; Bernhardt and Felter, 2004; Gazmararian, et al., 2014; Kennedy, et al., 2011; Kim, 2013; Kim, et al., 2015 ; Yoo, 2004). Finally, regarding source preferences of friends or family members, several previous studies have demonstrated that people prefer health-related sources from family members or friends (Bailey, 2008; Kim, 2013; Kim, et al., 2015; Yi, et al., 2012). The current study adds to the literature that, among several family members, mothers of young healthy children preferred advice from their husband and/or spouse or their mother and/or mother-in-law, rather than from their father and/or father-in-law or from other relatives. In addition, within the friends category, this study confirmed that mothers expressed their preferences of their friends with kids or co-workers as health information source to their friends without kids. This study has some limitations. The researcher used an online survey method with a non-probability sampling method. As the potential participants were recruited from several online communities, it was challenging to know their demographic characteristics in advance and implement other sampling techniques. Because of that, the sample may be biased and atypical in some characteristics such as extremely high education level, household income, or a high rate of insured participants among the U.S. sample. For example, the income levels of the U.S. sample were relatively high with over 50% having more than $100,000 annual household income, compared to the 2016 U.S. median household income of $57,617 (Guzman, 2017). As another example, almost all U.S. respondents had health insurance for herself and for her children, which is notably high compared to recent data of the uninsured U.S. population from the Kaiser Family Foundation (2016). Therefore, the samples may not fully represent all mothers living in the U.S. Therefore, generalisation of the findings should be carried out with caution. More in-depth qualitative studies such as detailed interviews or focus groups would help elucidate the differences in health information needs, searching behaviour, and source preferences among these two distinct groups of mothers of young, healthy children. The current research examined the health information needs, searching, and source preferences among mothers of young healthy children living in the U.S. With a rapid increase of immigrants in the U.S., understanding their information needs and behaviour is crucial for information professionals. By conducting a comparative study between the native and immigrant populations, this study found: 1) although the participants of this study were defined as mothers of healthy children, they had high information needs about specific diseases or diagnoses; 2) nearly all mothers (U.S. mothers = 93.0%; Korean mothers = 94.2%) had sought health information related to their children in both groups; 3) of the fourteen information sources, the World Wide Web was the most frequently used source for both groups; 4) individual characteristics were more significantly associated with U.S. mothers compared to Korean mothers; and 5) when source preferences were compared, U.S. mothers preferred human sources (e.g. doctors, nurses, husband and other relatives), whereas Korean mothers preferred non-human sources (e.g. online communities, books). The study's findings have implications for practice and for future research. First, appropriate use of the Web and social media (e.g. online forums, or social networking sites) has great potential for information professionals, healthcare providers or government health agencies who reach out to mothers of young children when providing health-related information. It was confirmed that mothers are active health information seekers and health managers concerned about their children's health. Second, ordinal regression was a useful method to test the relationship between individual characteristics and each information sources' frequency of use. This method would be invaluable to determine the relationships between an ordinal-level dependent variable and more than one independent variable. Lastly, information horizon theory was a useful theoretical framework to graphically illustrate mothers' preferences of nineteen information sources. Those comparative horizons imply that, when disseminating health information to immigrants, reaching out through non-human sources (e.g. the Web, online communities, books) may be feasible. The author would like to thank Dr. Catherine Arnott Smith, Dr. Kyung-Sun Kim, Dr. Ethelene Whitmire, and Dr. Soyoung Kim for their insightful suggestions on this paper. The author is also grateful to two reviewers for providing helpful comments to improve this research. Lastly, the author's special gratitude goes to the mothers who participated in this study and shared their invaluable experience. Ahuvia, A. (2001). Traditional, interpretive and reception based content analyses: improving the ability of content analysis to address issues of pragmatic and theoretical concern. Social Indicators Research, 54(2), 139-172. Allen, M., Matthew, S. & Boland, M. J. (2004). Working with immigrant and refugee populations: issues and Hmong case study. Library Trends, 53(2), 301-328. Archibald, M. M., Caine, V., Ali, S., Hartling, L. & Scott, S. D. (2015). What is left unsaid: an interpretive description of the information needs of parents of children with asthma. Research in Nursing & Health, 38(1), 19–28. Baker, L. M., Wilson, F. L., Nordstrom, C. K. & Legwand, C. (2007). Mothers' knowledge and information needs relating to childhood immunizations. Issues in Comprehensive Pediatric Nursing, 30(1-2), 39-53. Bernhardt, J. M. & Felter, E. M. (2004). Online pediatric information seeking among mothers of young children: results from a qualitative study using focus groups. Journal of Medical Internet Research, 6(1), e7. Caidi, N., Allard, D. & Quirke, L. (2010). The information practices of immigrants. Annual review of information science and technology, 44, 493-531. Carolan, M. (2007). Health literacy and the information needs and dilemmas of first-time mothers over 35 years. Journal of Clinical Nursing, 16(6), 1162-1172. Chae, J. & Quick, B. L. (2015). An examination of the relationship between health information use and health orientation in Korean mothers: focusing on the type of health information. Journal of Health Communication, 20(3), 275-284. Cohen, J. (1988). Statistical power analysis for the behavioral sciences. (2nd ed.). Hillsdale, NJ: Erlbaum Associates. Criss, S., Woo Baidal, J. A., Goldman, R. E., Perkins, M., Cunningham, C. & Taveras, E. M. (2015). The role of health information sources in decision-making among Hispanic mothers during their children's first 1000 days of life. Maternal and Child Health Journal, 19(11), 2536–2543. Davis, R. E., Cole, S. M., McKenney-Shubert, S. J., Jones, S. J. & Peterson, K. E. (2017). An exploration of how Mexican American WIC mothers obtain information about behaviors associated with childhood obesity risk. Journal of Nutrition Education & Behavior, 49(3), 187-195. Eaves, L., Ho, H., Laird, B. & Dickson, S. (1996). Raising a child with Down syndrome: parents' evaluations of health information and support. Down Syndrome Research and Practice, 4(2), 65–69. Emmanuel, E., Creedy, D. & Fraser, J. (2001). What mothers want: a postnatal survey. The Australian Journal of Midwifery, 14(4), 16-20. Fain, N. (2009). Internet use among parents of children with autism spectrum disorders (ASD). (Unpublished doctoral dissertation). The University of Texas Medical Branch, Galvaston, Texas, U.S.A.
Field, A. (2009). Discovering statistics using SPSS. (3rd ed.). Los Angeles, CA: Sage Publications. Garson, G. D. (2014). Ordinal regression. Asheboro, NC: Statistical Associates Publishing. Gaskell, G. & Bauer, M. W. (2000). Towards public accountability: beyond sampling, reliability and validity. In M. W. Bauer & G. Gaskell (Eds. ), Qualitative researching with text, image and sound (pp. 336-350). London: Sage Publications. Gazmararian, J., Dalmida, S., Merino, Y., Blake, S., Thompson, W. & Gaydos, L. (2014). What new mothers need to know: perspectives from women and providers in Georgia. Maternal & Child Health Journal, 18(4), 839-851. Golafshani, N. (2003). Understanding reliability and validity in qualitative research. The Qualitative Report, 8(4), 597-607. Greyson, D. (2017). Health information practices of young parents. Journal of Documentation, 73(5), 778-802. Guendelman, S., Broderick, A., Mlo, H., Gemmill, A. & Lindeman, D. (2017). Listening to communities: mixed-method study of the engagement of disadvantaged mothers and pregnant women with digital health technologies. Journal of Medical Internet Research, 19(7), 1-11. Guerra-Reyes, L., Christie, V., Prabhakar, A., Harris, A. & Siek, K. (2016). Postpartum health information seeking using mobile phones: experiences of low-income mothers. Maternal & Child Health Journal, 20(S1), S13-S21. Guillaume, L. R. & Bath, P. A. (2004). The impact of health scares on parents' information needs and preferred information sources: a case study of the MMR vaccine scare. Health Informatics Journal, 10(1), 5-22. Hearn, L., Miller, M. & Fletcher, A. (2013). Online healthy lifestyle support in the perinatal period: what do women want and do they use it? Australian Journal of Primary Health, 19(4), 313-318. Holtz, B., Smock, A. & Reyes-Gastelum, D. (2015). Connected motherhood: social support for moms and moms-to-be on Facebook. Telemedicine and E-Health, 21(5), 415–421. Huh, J., Delorme, D. E., Reid, L. N. & Kim, J. (2013). Korean Americans' prescription drug information seeking and evaluation and use of different information sources. Journal of Health Communication, 18(5), 498-526. Kennedy, A., Basket, M. & Sheedy, K. (2011). Vaccine attitudes, concerns, and information sources reported by parents of young children: results from the 2009 Health Styles Survey. Pediatrics, 127(S1), S92-S99. Kilicarslan-Toruner, E. & Akgun-Citak, E. (2013). Information-seeking behaviours and decision-making process of parents of children with cancer. European Journal of Oncology Nursing, 17(2), 176–183. Kim, K-S., Sin, S-C. J. & Tsai, T-I. (2014). Individual differences in social media use for information seeking. The Journal of Academic Librarianship, 40(2), 171-178. Kim, M. H. & Kim, H. J. (2007). Participation of mothers in the Internet community: relationship to their perceptions of social support and parenting efficacy. Korean Journal of Children, 28(3), 1–17. Kim, W. (2013). The role of social support and social networks in health information seeking behavior among Korean Americans. (Unpublished doctoral dissertation). George Mason University, Fairfax, Virginia, U.S.A.
Kim, W., Kreps, G. L. & Shin, C-N. (2015). The role of social support and social networks in health information--seeking behavior among Korean Americans: a qualitative study. International Journal for Equity in Health, 14(1), 1-10. Koehly, L., Peters, J., Kenen, R., Hoskins, L., Ersig, A., Kuhn, N. & ... Greene, M. (2009). Characteristics of health information gatherers, disseminators, and blockers within families at risk of hereditary cancer: implications for family health communication interventions. American Journal of Public Health, 99(12), 2203-2209. Kowal, S. P., Jardine, C. G. & Bubela, T. M. (2015). “If they tell me to get it, I'll get it. If they don't…”: immunization decision-making processes of immigrant mothers. Journal of Public Health, 106(4), 230-235. Lagan, B. M., Sinclair, M. & Kernohan, W. G. (2006). Pregnant women's use of the Internet: a review of published and unpublished evidence. Evidence Based Midwifery, 4(1), 17-23. Lee, H. S. (2017). Health information needs and seeking behaviors among Korean mothers of young children in the United States. Journal of the Korean Biblia Society for Library and Information Science, 28(1), 209-228. Lincoln, Y. S. & Guba, E. G. (1985). Establishing trustworthiness. In Y.S. Lincoln & E.G. Guba, Naturalistic inquiry (pp. 289-331). Newbury Park, CA: Sage Publications. Loudon, K., Buchanan, S. & Ruthven, I. (2016). The everyday life information seeking behaviours of first-time mothers. Journal of Documentation, 72(1), 24-46. Lwoga, E. T. & Mosha, N. F. (2013). Information seeking behaviour of parents and caregivers of children with mental illness in Tanzania. Library Review, 62(8/9), 567–584. Moon, S. (2003). Immigration and mothering: case studies from two generations from Korean immigrant women. Gender & Society, 17(6), 840-860. Murphree, A. M., Whitehead, M. T. & Painter, S. (2011). Providing literature and resources to expectant mothers of children with Down Syndrome. Journal of Women's Health Physical Therapy, 35(1), 30. Neuendorf, K. A. (2017). Content analysis guidebook. (2nd ed.). Thousand Oaks, CA: Sage Publications. Neuendorf, K. A. (2002). Content analysis guidebook. Thousand Oaks, CA: Sage Publications. Oh, K. M., Jun, J., Zhao, X., Kreps, G. L. & Lee, E. E. (2015). Cancer information seeking behaviors of Korean American women: a mixed-methods study using surveys and focus group interviews. Journal of Health Communication, 20(10), 1143-1154. Oh, K. M., Kreps, G. L., Jun, J., Chong, E. & Ramsey, L. (2012). Examining the health information-seeking behaviors of Korean Americans. Journal of health communication, 17(7), 779–801. Oh, K. M., Kreps, G. L., Jun, J. & Ramsey, L. (2011). Cancer information seeking and awareness of cancer information sources among Korean Americans. Journal of Cancer Education, 26(2), 355-364. Park, H. & Park, M. S. (2014). Cancer information-seeking behaviors and information needs among Korean Americans in the online community. Journal of Community Health, 39(2), 213-220. Park, S. H., Patil, C. L. & Norr, K. F. (2016). Korean immigrant motherhood: child-rearing and child weight. Family and Community Health, 39(1), 3-12. Pinkerton, C. M. (2010). Learning the culture of natural family living through participation in an online community of practice. (Unpublished doctoral dissertation). University of Virginia, Charlottesville, Virginia, U.S.A.
Plantin, L. & Daneback, K. (2009). Parenthood, information and support on the internet: a literature review of research on parents and professionals online. BMC Family Practice, 10, 34. Savolainen, R. & Kari, J. (2004). Placing the Internet in information source horizons: a study of information seeking by Internet users in the context of self-development. Library & Information Science Research, 26(4), 415-433. Sawilowsky, S. (2009). New effect size rules of thumb. Journal of Modern Applied Statistical Methods, 8(2), 467–474. Sayakhot, P. & Carolan-Olah, M. (2016). Internet use by pregnant women seeking pregnancy-related information: a systematic review. BMC Pregnancy and Childbirth, 16, 65-75. Sin, S. J. & Kwon, N. (2017). Displacement or complementarity? assessing the relationship between social media and public library usage in U.S., South Korea, and Singapore. Library and Information Science Research, 39(3), 169-179. Skranes, L., Løhaugen, G., Botngård, A. & Skranes, J. (2014). Internet use among mothers of young children in Norway: a survey of Internet habits and perceived parental competence when caring for a sick child. Journal of Public Health, 22(5), 423-431. Sligo, F. & Jameson, A. M. (2000). The knowledge-behavior gap in use of health information. Journal of The American Society for Information Science, 51(9), 858-869. Slomian, J., Bruyère, O., Reginster, J. Y. & Emonts, P. (2017). The internet as a source of information used by women after childbirth to meet their need for information: a web-based survey. Midwifery, 48, 46-52. Smallwood, R. R. (2014). Health and wellness of the postpartum woman based on cultural and personal perceptions of mediated representations of pregnancy. (Unpublished doctoral dissertation). University of Alabama, Tuscaloosa, Alabama, U.S.A.
Sonnenwald, D. H. (1999). Evolving perspectives of human information behavior: contexts, situations, social networks and information horizons. In T. D. Wilson & D. K. Allen (Eds. ), Exploring the contexts of information behavior: proceedings of the second international conference in information needs, seeking and use in different contexts (pp. 176-190). London: Taylor Graham. Sonnenwald, D. H. (2005). Information horizons. In K. Fisher, S. Erdelez, and L. McKechnie. (Eds. ), Theories of information behavior (pp. 191-197). Medford, NJ: Information Today. Suh, H.-J. (2004). Use of Internet as sources of information for purpose of rearing: differences between Korean and U.S. parents. Korean Journal of Children, 25(6), 321–335. Teddlie, C. & Tashakkori, A. (2009). Sampling strategies for mixed methods research. Foundations of mixed methods research: integrating quantitative and qualitative approaches in the social and behavioral sciences. Los Angeles, CA: Sage Publications. Tsai, T. (2013). Socialization and information horizons: source use behavior of first-generation and continuing-generation college students. (Unpublished doctoral dissertation). University of Wisconsin-Madison, Madison, Wisconsin, U.S.A.
Weiner, J. L., Fisher, A. M., Nowak, G. J., Basket, M. M. & Gellin, B. G. (2015). Childhood immunizations: first-time expectant mothers' knowledge, beliefs, intentions, and behaviors. American Journal of Preventive Medicine, 49(6), S426-S434. Yi, Y. J., Stvilia, B. & Mon, L. (2012). Cultural influences on seeking quality health information: an exploratory study of the Korean community. Library & Information Science Research, 34(1), 45-51. Yi, Z. (2016). Effective techniques for the segmentation of academic library users. Library Management, 37(8/9), 454-464. Yoo, E. (2004). Factors affecting middle-aged women's information seeking on the web. (Unpublished doctoral dissertation). University of Wisconsin–Madison, Madison, Wisconsin, U.S.A.